What exactly are portable saunas? Well, there is very little difference from a normal sauna. It serves the same purpose except that it is smaller, lighter and well of course, portable! We have already covered the numerous benefits of using sauna which include relaxation, stress relief, detoxification, weight loss, pain relief and many more. Mobile saunas come in two basic types. These are wet saunas where heated steam is used and dry saunas where Far Infrared (FIR) rays are used to heat the body. The main advantage of using portable saunas is that they are extremely easy to set up, use then break down and store. They are an excellent choice if you are short on space and you can’t set up a permanent sauna. Also, they work using ordinary power outlets which means you don’t have to go through the trouble of having someone fix the electrical system as you would need to do if you were installing a normal sauna. They are also compact in size and lightweight and if you move around a lot, you can carry your sauna with you. Portable saunas are usually designed to fit one or two people and most come with optional head covers for those who are claustrophobic. Another advantage of purchasing a portable steam sauna is that they are very affordable and at least 10 times cheaper than buying a permanent sauna unit. You can buy portable saunas for under $200 which makes owning a sauna within the reach of almost anyone. The portable traditional saunas use heaters which can create steam between 150 and 190 degrees Fahrenheit. Many of these saunas which are similar to the traditional Finnish type of saunas use heated rocks. In order to produce steam you have to pour water over the heated rocks and using this method you can control the steam output. These saunas usually seat two to four people comfortably. Portable Infrared saunas on the other hand don’t produce steam. They instead use a ceramic heat emitter which emits Infrared rays which penetrate your skin. The wavelengths of the waves do not heat the air around you but rather your skin and tissues which causes you and not your surroundings to rise in temperature. There are many portable infrared saunas for you to choose from that are quite inexpensive. These saunas include the “sauna bag” options which have a dome design. These look like silver space cubes with an opening for your head and a chair inside for you to sit. Besides those, you can even wear a sauna suit which is like a silver track suit which you wear around the home. The portable sauna despite their strange shape have many great features. These include far infrared carbon fiber heating panels, foam floor pads, zipper door for entrance, a handheld timer and controls. The material in which the sauna is made out of is coated with a heat activated FIR material. Besides the “sauna cube” design, you can also buy a dome shaped sauna. It is shaped almost like a tented sleeping bag. This is popular because it is very comfortable and allows you to lie down while using the sauna. You entire body is surrounded by the dome with the exception of your head. One of these units can be bought for $320+ which makes it an affordable solution. The sauna dome allows you to enjoy be surrounded 360 degrees in FIR emitted dry heat. 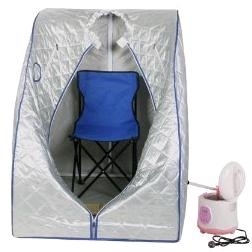 The ability to buy a portable steam sauna is a huge plus for the modern lifestyle. If you are worried about infrared heat and rays then you shouldn’t because they are completely safe. In hospitals, they are even used to warm babies. Besides that, it is great because it is affordable to anyone who wants the benefits of using a sauna but doesn’t have thousands of dollars to spend buying one. A portable sauna is an excellent option until you are able to install a permanent home steam sauna.